Trees for Life is Scotland’s leading conservation volunteering charity, working to restore the ancient Caledonian Forest to the Scottish Highlands. 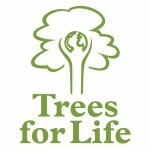 In 2012 we planted our millionth tree and we are currently working towards establishing the next million by 2018. The Caledonian Forest once covered a large part of the Highlands as extensive stands of majestic Scots pines, interspersed with birch, rowan, juniper and aspen trees. It was the UK’s equivalent of the rainforest but has been reduced to just a tiny fraction of its former range. Most of the surviving forests now consist of old trees reaching the end of their lifespan, with no new trees replacing them because of overgrazing by deer and sheep. Urgent action is required to conserve and extend these forests before it is too late.